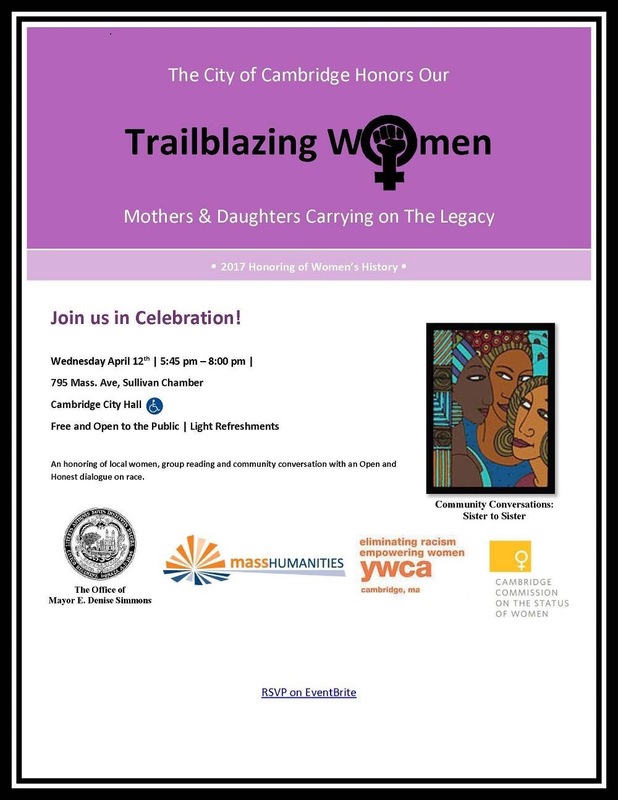 Cambridge will Honor Trailblazing Women on Wednesday April 12, 5:45-8 p.m., at City Hall, Sullivan Chamber, 2nd Floor, 795 Mass. Ave. Join us for an evening of honoring local women, a group reading of Audre Lorde’s “The Transformation of Silence into Language and Action,” as well as community conversation with an Open and Honest dialogue on race. Free and open to the public. Light refreshments will be served. This event is hosted by the Office of Mayor E. Denise Simmons in collaboration with Community Conversations: Sister to Sister, Massachusetts Foundation for the Humanities, YWCA Cambridge and the Cambridge Commission on the Status of Women.